When the cold weather hits, it’s time to think about breaking out the snow boots. There are many different styles and types of snow boot, from lace up to slip on. Because these boots only come out at certain times of the year people often wonder how to wear them, when to wear them, why wear them and when to buy them. They are seen as very difficult to style, however, picking a great outfit to team with your snow boots is actually fairly simple. Snow boots are some of the warmest winter boots. And as the temperature slowly slips down, you need shoes that are built especially to keep your feet nice and toasty. Snow boots usually have a temperature rating, this lets you know how cold the temperature can get before your feet get cold. If you’re going to be visiting somewhere particularly cold, look for boots with a good thermal rating. If you’re often walking in deep snow, leather or suede are more suitable than nylon. One of the pros of snow boots is the good grip which allows you to walk safely across slippery snow and ice. The best snow boots have grooved treads which help prevent you slipping. If you find your boots don’t have a great tread and don’t have as strong of a grip as you’d like, there are things you can buy to provide more grip. For extreme conditions, snow grips can be added to your boots. These look like springs on elastic that wrap around the soles of your boots, increasing traction. However, these shouldn’t be necessary and snow boots should be capable of providing enough grip on their own. Snow boots generally need to be very durable as they need to protect your feet from a lot of different things. They give your ankles support, protect your feet from the cold and wet. They are made to protect your feet for a long time. They are durable, however, if you use them often they will need looking after and will eventually need replacing. To cope with a slippery floor and unsteady ground, your snow boots need to provide your feet and ankles with support. They have a little extra padding around the foot and they usually lace all the way to the top of the boot. This means they provide a comfortable support for the whole boot length. It is always best to buy your necessities for each season in advance. When a season begins, the basics for that season will come out and sometimes, at a higher price. This is because demand drives up prices. Also, due to everyone needing the same thing at a certain time, you may not be able to find the boots you like in your size. Buying your snow boots before winter comes will save you money and you’ll have time to find the boots you like. However, you might not find snow boots on sale all year round. Our best advice is to buy your pair before the winter sets in so you don’t get caught out by extreme weather. If a snow flurry does take you by surprise and you’re worried about setting foot outside, why not order your snow boots online? If you’re considering a pair right now, take a look at our women’s snow boots, men’s snow boots, and kid’s snow boots. As snow boots are so warm, you won’t want to be wearing them in the middle of summer. However, as soon as the temperature begins to drop, the snow boots can come out. As long as your snow boots are waterproof, they can be worn in the rain as the water can’t penetrate the soles. You can wear snow boots whenever you would like to, it’s not necessary to wait for snow or ice even though this is what snow boots are primarily built for. If you like toasty, comfy feet then break out the snow boots at any time during the winter months! Just bear in mind that your snow boots will be warmer and chunkier than normal boots. Women: There are many ways to style women’s winter snow boots. This partly has to do with the fact that snow boots come in many different styles and colours. 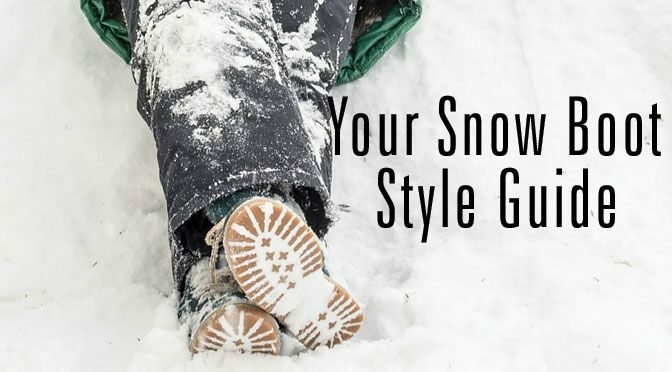 Many people often think that snow boots only come in non-fashionable styles, this isn’t true. There are styles of snow boots that are stylish and you can create a stylish look with your outfit. A classic way to wear snow boots is with skinny jeans. They tuck perfectly into boots and are so easy to wear. You can throw a jumper and your favourite coat on and you have an outfit! You could swap out the jeans for some leggings, add a cropped jacket or a fitted turtleneck jumper. If you have quite bulky snow boots, you can wear a more fitted or cropped top to balance the look out. If it’s not too cold, you can wear your snow boots with a pair of black tights and a skirt, or dress. Some boots have a thick fluffy insole, so you can wear your tights without socks. If your boots don’t have such a thick insole, so you may want to add a pair of thick socks for comfort. Men: For men’s snow boots, jeans are also perfect for the occasion. They can be tucked into the boots, or can just fold over the top. Pair this with a casual sweater or hoodie and you’re good to brave the elements. Snow boots come in many different styles, some are slip on boots and others are lace up boots. Slip on boots usually have more room inside. This is good if you want to layer up on your trousers or socks. Lace-up boots have a little less room as they fit your legs, though, due to the lace, they are adjustable. You can wear snow boots with many different items, wear them as you would your normal boots. They are a handy item to have in your wardrobe. Whether you only go on ski holidays or you live in a cold climate, you never know when you’re going to need a pair of fully waterproof and weatherproof boots. Hi, I would like to tell u of the fantastic customer service I received when I took some boots back as the zip had broken after a few weeks use. I had no receipt [they were an xmas gift]. The lady who served me was lovely.She dealt with it very profesionally, told me that they didn’t have my replacement boot in my size in stock,but, said they would be ordered and delivered to my home free of charge. I didn’t catch her name but she works at the Norwich St Stephens branch. It was approximately 11.15 on Monday 30.01.17. I would like it if she could be tracked down and tell her how great she was. I work in retail myself and her service was 10 out of 10!. Thank you. Thank you for your lovely comments, we are so happy to hear that our Norwich store were able to help you with replacing your boots. We will of course pass along your comments & look forward to welcoming you back into store.